Thirty-five miles west of the Mackinac Bridge along Highway 2, travelers will chance upon a quaint white building with six cozy cottages. Originally called Miller’s Store, the old-time resort is situated between Hog Island and Davenport Creeks, but only for the last 60-some years. Its history tracks back to 1914, when the building was originally constructed as one of many cabins for a lumber camp in Wilwin — about seven miles north of Trout Lake. Wilwin was started by one of two Chesbrough brothers in 1913, and was where the wood for the building was cut and milled. It continued operations until 1922. 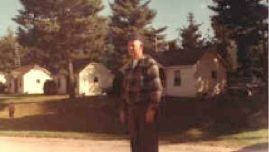 After World War I, the mill was never reopened, and sometime after 1923 Jim Miller from Manistique bought one of the camp buildings, moved it to Rexton, and opened a general store. Around 1942 when U.S. 2 was built, Miller (pictured at right) moved the building to its present location, along with six rental cabins. He and his wife Fern operated the store and rented cabins to weary travelers, vacationers and hunters. The Millers put in Gulf Oil gas pumps and carried groceries and liquor in the store, quite an oasis for travelers in those days. Jim had a notable reputation as a storyteller and never missed an opportunity to impart a lengthy anecdote to all who were willing to listen. After Jim Miller passed away, the operation was closed for four years before being purchased in 1985 by Ed and Betty Holtz. They revived the business under the name of Holtz’s Parti Store & Cottages. Any place neglected for that long a time in this part of the country requires a lot of work, but Ed and Betty proved to be up to the task. When the Holtzes were ready to retire to the warmer climes of the southwest in 1993, Gino and Ellen Farone shifted from merely vacationing in Naubinway to living and working there, and changed the name to Hog Island Country Store & Cottages. Years ago, while bound for nearby historic Fayette State Park, Tom and Sandy Jacobs passed a cute set of cottages on the side of the road with a for sale sign out front. Sandy immediately fell in love with the cottages and the incredible Lake Michigan location. 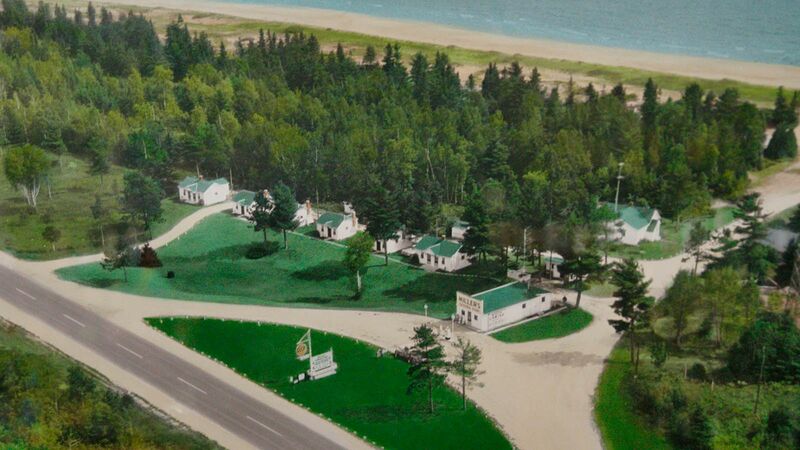 So they packed their bags, left the Lower Penisula and made their way to Naubinway to become the new owners of Hog Island Country Store & Cottages. The cabins have been modernized over the years to include bathrooms and kitchenettes, and are fed by an artisan well. A short jaunt behind the cabins brings you to a beautiful white sandy beach on the Lake Michigan shore. Summers bring many families to the cottages where they can cook either inside or on the barbecues while the kids play on the teeter-totters and tree swings on the front lawn. Down at the beach, the water is shallow, perfect for small children and people who like to wade. The firepit near the beach has heard many a ghost storiy and sing-along over the years. When you visit the store and cottages now, you’ll find the gas pumps gone, but the quaintness remains. Many people make it a regular stop for some of the best smoked fish and beef jerky in the Upper Peninsula. You’ll also find wild rice, Mackinac fudge, Hiawatha pasties, Keewanaw jams and pure maple syrup from the U.P. always in stock. Jim Miller would be proud his oasis continues after the turn of the century and the Wilwin lumber camp workers or their descendants might be amazed that some of their work still stands.